Serve this easy-to-make, yet sensational, baked side dish with your favourite roasted meat, such as chicken or beef. 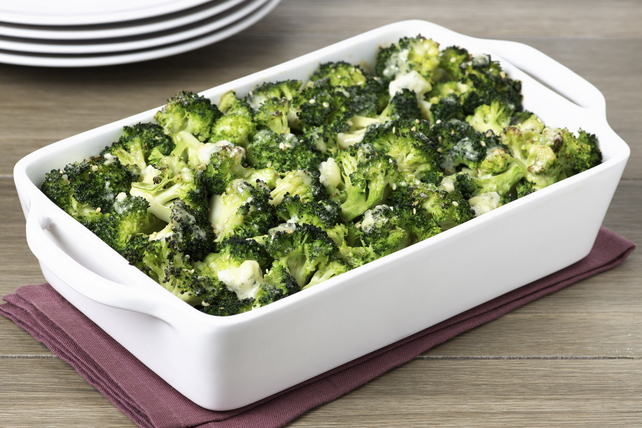 Place broccoli in 13x9-inch baking dish sprayed with cooking spray; sprinkle with lemon juice. Beat eggs, cheese and dip in large bowl with mixer until blended; pour over broccoli. Bake 25 to 30 min. or until centre is set. Sprinkle with sesame seed. Substitute toasted pine nuts, or chopped toasted almonds or walnuts for the sesame seed. Both rich and delicious, Gorgonzola cheese can be expensive. For a less-expensive option, prepare this easy-to-make vegetable side dish using your favourite variety of blue cheese, such as Danish blue.